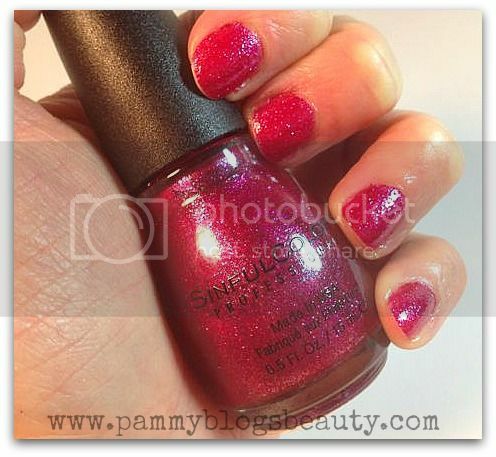 Have you seen the Fall 2013 SinfulColors Fall Polish Collections yet at your local Walgreens? OMG! These collections are beautiful! This Fall, SinfulColors is all about deep rich colors and interesting finishes. If you are into glitters or mattes, then you *must* check these polishes out!!! Do you know what is truly amazing? These gorgeous polishes are only $1.99 each. What a steal!!! Plus, the quality is totally high-end. If you love following all of the lasted trends in nails, these new SinfulColors collections are spot-on for Fall of 2013 as far as color selection, texture, and finish! Tease, taunt and turn heads this fall with the SinfulColors Leather Luxe Collection. A texture rich, trend-setting collection of stylish matte finish nail polish shades which are richly pigmented to provide a flirtatious way to flaunt your style. The Leather Luxe Collection features eight weather-warming shades with leather-inspired finishes. To find out more about these polishes (and see more photos and swatches), please click "read more" below! What gorgeous and rich matte shades! I selected two colors to try: Whipped (matte black) and Cold Leather (matte navy). I love wearing both of these shades. They give your nails such an elegant and sleek look! Whenever I do a matte manicure, I like to top it with my favorite matte topcoat from Butter LONDON (just to give my nails a bit more strength). My nails are very weak (I blame heredity. I just don't grow strong nails). You certainly wouldn't want to top a matte polish with a shiny top coat, that would defeat the purpose. So, my trusty Butter LONDON Matte Finish Top Coat is getting a ton of use! :) Plus, did you know that Butter London's Matte Finish Top Coat can transform any polish into a matte??? So cool!!! Sparkle and glimmer this fall with SinfulColors shade collection: Crystal Crushes. It is a brilliant collection of gem-inspired nail polish shades with multifaceted 3D texture. Gorgeous matte colors flecked with a reflective pearl finish sure to dazzle your digits and make your heart skip a beat. The Crystal Crushes collection features eight vivid shades sprinkled with an angel dust finish. These Crystal Crush polishes are soooo pretty!!! I am such a huge fan of glitter and shimmer on my nails. What can I say? I am quite a girly girl! These glittery polishes lay down a ton of sparkle and shine with a rich base color shade. You get opaque coverage in one coat (although I do like to wear 2 coats, in general). I tried the shade "Got a Blush on You" (an incredibly beautiful fuchsia) I am starting to realize that fuchsia shades are amongst my favorite colors to wear on my nails and lips lately. So flattering on cool toned fair skin!!! I also tried "Purple Gleam" which is a richly sparkling Lavender. Love it, too! Next time you are in Walgreens, be sure to check out these gorgeous Fall 2013 Leather Luxe and Crystal Crushes collections from SinfulColors!!! At $1.99 each, you can pick up a ton of polish without breaking your budget! Have you tried any polishes from these collections? What shades are you loving? Or what shades would you like to try?